A large upper ridge extends across the west and central Europe while deep trough and surface cyclone cross Scandinavia. A large upper low moves across the E Mediterranean. Another upper low remains over Morocco. ENH risk has been issued for extreme E Mediterranean, S Turkish coast and Cyprus with threat for severe storms, capable of producing severe winds, torrential rainfall, marginally large hail and some tornado threat. An overlap of favorable helicity, shear and marginal instability should allow well organized slow moving storms to develop. SLGT risk has been issued for areas surrounding the ENH risk including much of the E Mediterranean for isolated severe storms. 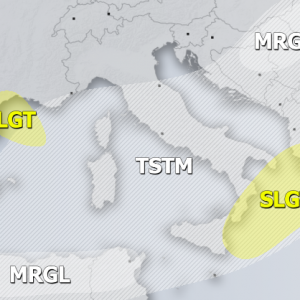 SLGT risk has been extended west towards the S Aegean sea where excessive rainfall threat on the rear side of the cyclone exists. ENH / SLGT risks have been issued for NW Turkey, S Greece, Aegean sea and Crete with threat for severe winds, locally in excess of 110 km/h. ENH / SLGT risks have been issued for Norwegian sea into N and W Norway with threat for severe to extremely severe wind gusts, locally in excess of 120 km/h.